Indulge in your cappuccino and latte like never before with just a touch of a button with Tassimo's awesome coffee machines. No need to go to the cafe if you're ever craving for flavourful coffee. Now you can create your very own brew of refreshing drink at the comfort of your own home. Impress your friends during get-togethers by looking for cheap deals on Tassimo coffee machines from Amazon, Currys PC World, ASDA, B&M, Very, Debenhams, Robert Dyas and Argos. Get the savings you need by using a voucher code on top of any special offers. 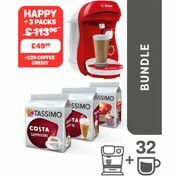 TASSIMO by Bosch Happy Coffee Machine Various Colours - Save £60! 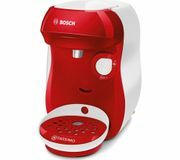 TASSIMO by Bosch Vivy2 TAS1403GB Hot Drinks Machine - Red or White - HALF PRICE! When it comes to the manufacturing of coffee makers, and any other products related to it, Bosch is a name that is always mentioned. It has always been synonymous to happy consumers and that remains the same up until now. As a proof to this, they have a popular creation – the Tassimo coffee maker, which continues to develop and improve as the time progresses. There are various kinds of coffee machines and they would usually differ in shape, sizes, colour and of course – functionality. Most Tassimo machines are simple. While there are those with complex operations, apart from brewing the regular coffee you are accustomed to. Regardless, Tassimo coffee maker with its Tassimo Pods, will remain to be one of the best machines there is in the market. Needless to say, Tassimo is not only a plain coffee maker. This beverage system upholds outstanding quality and fashionable design. This breakthrough in technology will always have its purpose and it is quite hard to match – most especially by its contemporaries. Make this a part of your everyday coffee. Prepare your delicious hot drinks with this innovation in the comfort of your home. If it is your first time experiencing this brand, or if you have been using it for a long time now, the internet is there to provide you with larger options that you can use to your advantage. Find affordable deals and get the Tassimo product that you prefer without compromising your wallet. 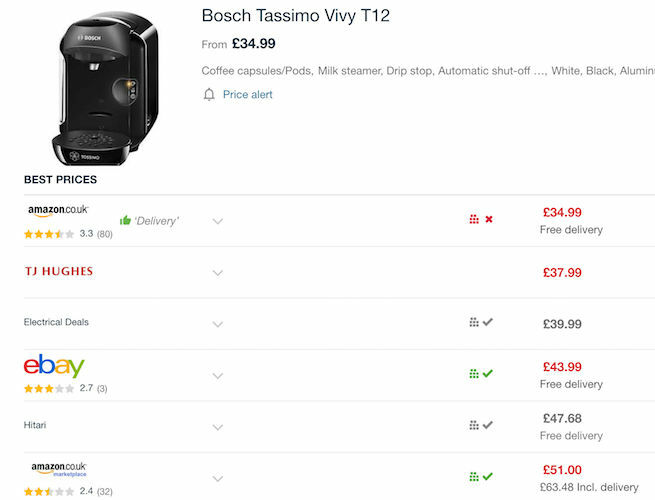 Where Can I Find Cheap Tassimo Deals? 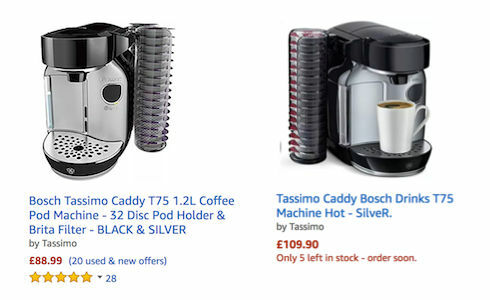 From Tassimo discs to free Tassimo pods and Tassimo variety pack to compatible pods, you can always find the best Tassimo machines at Latest Deals. Make the most of deals, sales, price drops, and special offers only exclusive to our members. We have a team of money-saving experts and a community of bargain hunters who sweep the internet to get the most exciting deals in Tassimo compatible pods UK. Aside from this, we also feature the best voucher codes, discount codes, and special offers with the help of your most trusted brands such as Amazon, ASDA, B&M, Currys, Debenhams, eBay, Hughes, John Lewis, Poundstretcher, Tassimo and Very. Amazon. Take advantage of discounted Tassimo pods, discs and machines at Amazon. Checkout the retailer’s Pantry section for the latest money-saving deals. Amazon Prime member also gets exclusive discounts and free delivery. ASDA. 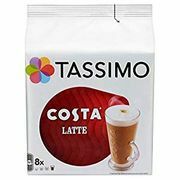 The retailer offers sales and discounts on its coffee pods and machines such as 3 for £10 on a wide selection of Tassimo pods from Costa Latte and Cappuccino to Kenco Mocha Coffee and Creamer from Milk. You will surely get your delicious caffeine fix without hurting your budget. B&M. B&M stocks a wide array of Tassimo Vivy machines and more. On top of the coffee makers and machines, there are also coffee, tea, hot chocolate and hot drinks you can buy. You can also get some decent savings on select pods. Currys. Find the Tassimo coffee machine that will suit your preference and budget at Curry’s. Their offerings include a 2 year guarantee and £20 webshop credits with select Tassimo coffee machines. You can also get free and fast delivery as well as flexible credit options for orders £99 and above. Debenhams. Enjoy traditional filter coffee, bean-to-cup coffee, and more with machines like Tassimo from Debenhams at its Electricals department. Take advantage of their free web credit on select Bosch Tassimo machines. This is the compact version of the Tassimo coffee maker. It measures 10cms wide. With this, you can keep your kitchen counter tidy and efficient without compromising your cup of coffee every day. This type is probably the most affordable Tassimo machine out there in the market. This is only £45 and you may even save more if you have obtained the right code or deal for you. Indeed, this Vivy is an entry-level Tassimo machine. Regardless, do not get this wrong because it does not mean that your coffee will be less. It has a 0.7L water tank too which makes it space-saving in nature. This brand is probably the answer as to how big a Tassimo water tank can get. This Tassimo T40 is available with a super-sized 2L water reservoir. With this, you will not have to be bothered refilling because there is enough space for your coffee needs. What is even better about this brand is that it has taken coffee making machines to its whole new level – visual feedback and customisation. On top of all these, there are also additional buttons which would enable you to modify the length of your brew duration. Aside from this, it also goes with an efficient cable storage solution that can help in keeping most wires out of sight. An innovated 1.2L water reservoir which allows the monitoring of water level even just from the front of the machine. There are models that do not have that kind of advantage. For most instances, electronic sensors are used as a replacement. Such is a combination of nice subtle and functionality. The Brita water filter is replaceable. It has a removable clip-on pod holder which is good news for your favourite drinks for sure. At least, you do not have to rummage in a dress or cupboard anymore. This essential rack is purposeful for sure. Compared to the many Tassimo coffee makers out there which are struck with black gloss, this T32 goes with a wide array of variation with striking colours. This is probably the more mature version of the compact Vivy T12. This also goes with a 0.8L slightly larger water reservoir, and as well as a larger footprint. The TAS5542 Coffee Machine is a replacement for many components of the affordable models of this coffee maker. 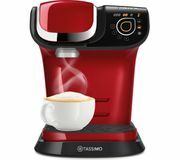 However, this is an upgraded version which is responsible for the sturdier, and superior quality of this Tassimo unit. Known as one of the biggest units in the family, this weighs around 3.5kg and measures 30 x 20 x 30 centimetres. Compared to the many newer models out there, this is ideal if you are from a hard-water area. This does not only have a Brita water filter, but it has almost 4x of them. This is ideal both for your taste buds and as well as machine internals. To do a research with this kind of product is the best part of your planning. Obtain as many information as you can about Bosch Tassimo coffee machine so that you can foresee if it is going to suit your lifestyle or not. When you are finally done with your research and you have already learned that Bosch is one of the top manufacturing companies there is, you will also realise that it can produce a high-quality product that may endure the test of time. There are various types of this machines and if you are a starter, you may get overwhelmed. As this is the case, be the first one to know the type of maker that you prefer. Newer coffee-makers will not only serve you coffee, they can also make you hot chocolate which is the best if you have children at home. Read more reviews about the product before buying one. If you can look at the feedback of most users, that is going to help too in deciding whether you pursue such item or not.